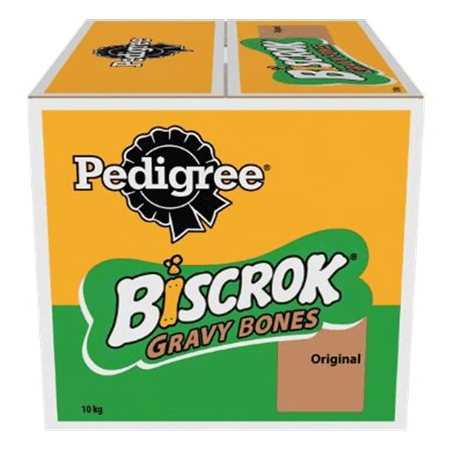 Pedigree Biscrok ® Gravy Bones is rated 4.8 out of 5 by 105. Rated 5 out of 5 by Styx from SO TASTY! We got our sample of Biscrok gravy bones in the post a couple of days ago. I'm not sure what the difference between these, and regular gravy bones are? I think these may be fractionally longer? They smell quite tasty, which is good, as I wouldn't feed my dogs something which didn't smell "right". Our 9 month old collie gets a whole one, and our jack russell gets 1/2 at a time, as hes only a wee lad. I also like that you can pour a whole box into the pedigree treat tin we got at christmas, to keep them safe from munching puppies! Rated 5 out of 5 by kaalee100 from PEDIGREE BISCROK GRAVY BONES Pedigree Biscrok Gravy Bones are small crunchy dog biscuits with a meaty gravy flavoured shell. Containing vitamins and minerals but without any artificial colouring nor flavouring they are definitely a good choice to feed as a treat. My GSD has very much enjoyed sampling these biscuits - I have fed her a portion of five at a time in place of any other reward treats for the last two weeks. I have seen this product at a reasonable price in the supermarket and will be happy to buy it in future. Rated 5 out of 5 by lkscotland from Bigger than expected! Well what can I say about the gravy bones - a massive hit with my lucky dog. More recently I've found her to be getting fussy with food. I've mixed a few of these bones in with her food and hey presto, back to eating her food again. I think it's gave her some variety to her meals. So as you can tell a massive hit with her. Great as a little treat too. Always waiting with a paw in the pair when the dog cupboard is open. For me they are nice to handle. Not sticky or smelly. Rated 5 out of 5 by kingairpilot from Gravy Bones Box We got a full box of Gravy Bones delivered for Ben our Border Collie. He actually got the the letter box before us and started opening the package himself. Never seen such a happy and waggy tail from him after getting into the package and having a few treats out the box. We now put them out of view and give him a few everyday and he still loves them and closes his eyes and enjoys each one like it's his last haha. Great treat and you get loads in the box. Rated 4 out of 5 by Fionaas from My dog absolutely loved the smell of these treats, as soon they arrived he went mad for them and was very excited to try them. However that is as much as his excitement went! As once he had one he didnt know what to do with it and left it. Which is a shame as they (from my eyes) looked good, didn't have to much of a smell (I'm sure Freddie, my dog would disagree!) and you got a good amount in the pack. A real pity my dog didn't like them. Rated 5 out of 5 by saraann from Look good enough to eat! My dog is generally very fussy when it comes to treats, so i was delighted to be able to try Biscrok gravy bones as a way of getting her to try something different. She loved them, she loved that the bones were actually coated in the gravy, so she licked that off first and devoured the biscuit. They are the perfect size for a small dog, such as mine, but equally as good for larger dogs. I will definitely be purchasing these in future. Rated 5 out of 5 by 1Pussycat from Them bones them bones A few weeks ago, I noticed Biscrok gravy bones, while looking for a treat for the dogs. These bone shaped biscuits are ideal, they are a good size, although the dogs would love them bigger and easy to handle. Can be bought in different size packs, the box is ideal to try out and larger bags available too. They are good value for money, good for the dogs and they really enjoy there bones. Will be treating them again. Rated 5 out of 5 by Happyd1976 from Firm Favourite What dog doesn't like a treat? Well mine are no exception and they LOVE these. No hesitation to say that if allowed they would eat the whole box in one sitting. Plenty of wagging tails and excitement when they hear the rattle of the bones in the box. Will keep buying these as my dog walking treats as they're a good size for in your pocket to share with the furry friends we meet. Small dogs, e.g. Dachshund, feed up to 2 biscuits per day. Medium dogs, e.g. Cocker Spaniel, feed up to 3 biscuits per day. Large dogs, e.g. Labrador, feed up to 7 biscuits per day. Please reduce main meal accordingly. Fresh drinking water should always be available.